The next chance has finally arrived. For 14 years, the Virginia football team has entered rivalry week with Virginia Tech with a single goal in mind. End the streak. The last time UVA won this game came on Nov. 29, 2003 when the Hoos prevailed 35-21 in Charlottesville. They haven’t won in Blacksburg, the location for this year’s game, since 1998. So yes, the Cavaliers enter the final week of the 2018 regular season with one thing on its mind. End the streak. That’s been the message since way back in the offseason and particularly since July when the Wahoos openly stated at the ACC Kickoff event that one of their main goals this season was to Beat Tech. From then until this week, UVA coach Bronco Mendenhall’s message has been the same. This game is not just another game and it is more important right now than any other game on the schedule for the Hoos. The reason is simple. The program can’t truly progress and can’t truly be on the right resurrection path without winning against Virginia Tech. Mendenhall said as much at time after time with the media on Monday. So yeah, that about sums it up. Does that put too much pressure on a favored UVA team to win? Is the breakthrough year finally here? Will the 20th anniversary of the Ahmad Hawkins’ catch finally bring home another win from Blacksburg? The time is here. Such a simple statement could be made a lot of weeks obviously, but this could be the most important part of this matchup. The extremes in wins and losses for Virginia Tech’s run defense is eye-opening. The Hokies have allowed just 108.5 rushing yards per game in their four wins, a number that skyrockets to 274.7 rushing yards per game in their six losses. For team’s rushing defense in losses, that ranks 113th nationally. VT has given up 24 rushing touchdowns in those six games. Three different players posted three rushing touchdowns against the Hokies. Pitt’s Qadree Ollison, Notre Dame’s Dexter Williams, and Georgia Tech’s Tobias Oliver all did it. Boston College’s Travis Levy had two rushing touchdowns too. On the flipside, Virginia’s tale of the tape with rushing offense looks similar in wins vs. losses. In wins, UVA has rushed for 204 yards per game with 15 rushing touchdowns. In losses, that changes to 113.75 yards per game and two rushing touchdowns. A year ago in a 10-0 loss to Tech, the Wahoos managed just 5 rushing yards. So yes, this simple statement may be one of the most important keys to breaking the streak. In recent years, VT’s defense has seemed vulnerable at times to running quarterbacks so the answer to getting the running game going may be Bryce Perkins. If the Hokies manage to bottle him up, will the Hoos be able to find running room elsewhere? In last year’s meeting a fumble early in the second half set up Virginia Tech for a short touchdown drive in its own territory and the Hokies blocked a punt too. In other years, it’s been a critical penalty late in the game, key turnovers, or a special teams gaffe. This Tech team is playing not only for the UVA streak, but for its own bowl streak of 26 years. The Hoos don’t want to give a struggling group any sort of momentum-boosting play in this one. That includes big scoring plays as well. Since quarterback Ryan Willis took over an injured Josh Jackson during the ODU game, he’s helped VT rip off some big touchdown plays. He threw touchdown passes of 27 and 67 yards against Duke. He rushed for a 33-yard touchdown against North Carolina. Against Georgia Tech, he tossed two more long TD passes of 46 yards and 41 yards. He followed up at Boston College with a 26-yard scoring pass before throwing TDs of 29 and 24 yards against Pitt. Overall, Willis has started the last six ACC games and has thrown 16 touchdown passes with only 6 interceptions. He’s also the team’s second-leading rushing on the season with 295 yards. The Cavaliers need to keep him in check in order to slow down VT’s offense. For the second straight week, this mantra holds the final spot. The Cavaliers decorated their facilities with ‘Beat Tech’ and have clearly circled this game on the schedule. Now the chance is there to deliver. A loss here would not only extend the streak, but it would represent a 1-3 finish after reaching the bowl plateau. Last season, the end of the season featured a similar slide with a 1-6 finish after a 5-1 start. Plus, UVA had a chance to get another ACC win last week at Georgia Tech after taking a 21-16 lead into the fourth quarter. 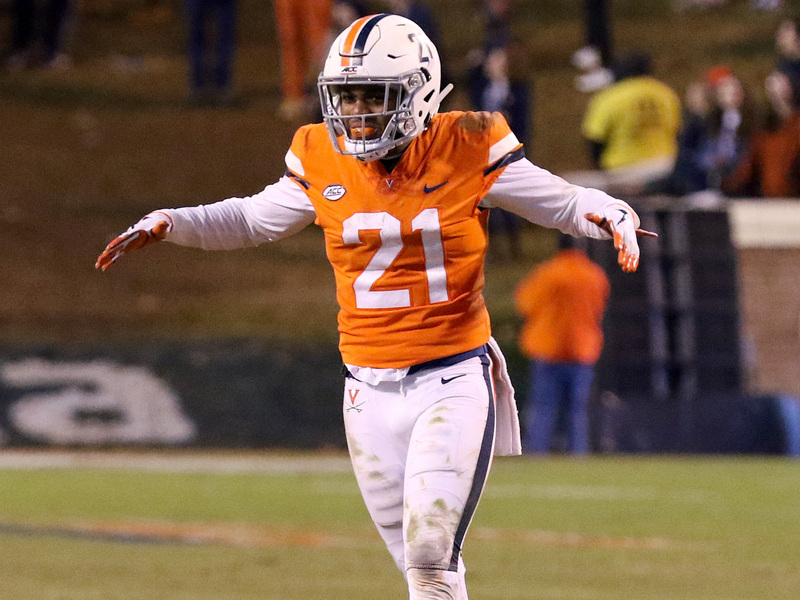 That slipped away after a special teams turnover, but the Hoos had another chance to take the lead late but they couldn’t convert on a 3rd-and-1 chance, settled for a field goal, and then lost on a missed kick in overtime. When you look at the matchup with the Hokies, the ‘finish’ line focuses on the second half. VT has outscored opponents by 25 points in the first half this season, but opponents own a 60-point edge in the second half. In Tech’s last five losses, opponents have won the second half 115-36. The Cavaliers have outscored their opponents in every quarter this season, including a 124-93 edge this season in the second half. A lot of progress has been made this season with back-to-back bowl bids for the first time since 2004 and 2005 and a winning record for the first time since 2011, but if the Hoos finish 1-3 down the stretch with a streak-extending loss at the end, that would be a disappointing cap to the 2018 regular season. Virginia came close to snapping this streak several times in the past 14 years, but couldn’t close the deal for varying reasons. At some point along the way, I remarked in these picks that I wasn’t picking UVA again until the Hoos actually won one to stop the streak. Last season, I broke my own rule and picked the Hoos. They eventually lost 10-0 in a game where a fumble set up the only touchdown for either team. So what about that rule now? The Cavaliers have been established as the favorite from the bet makers. They’ve clinched bowl eligibility so there’s no pressure to win to extend the season. They’ve got some personnel – like a mobile quarterback and a strong secondary – to offset some of Tech’s better pieces. The Hokies are reeling and on the verge of seeing their own bowl streak end. Etc. So this looks like a great chance. Will it happen? You better believe it! Hoos get a big running day and a big win. VIRGINIA 30, VIRGINIA TECH 17. Season to date: 7-4. Virginia is the better football team heading into its 100th meeting with Virginia Tech. If this were any other game, I’d pick the Cavaliers without hesitation. But it’s Virginia Tech, and I’ve seen UVA squander some golden opportunities over the course of this 14-game losing streak at the hands of the Hokies. I do think this Virginia team has a different mentality than previous squads, but can the Hoos play focused football for 60 minutes? I think so, but we’ll see. Bryce Perkins is an X-factor as he has the speed to break big plays against a Hokie defense that is prone to breakdowns this season. He needs help, though, and Virginia’s offensive line will have to play well and open things up for Jordan Ellis. In addition, UVA’s defense will have to pressure Ryan Willis and limit big plays surrendered. I think Chris Peace and company will come through in this regard. Perhaps against my better judgment, I think Virginia will defeat Virginia Tech in Blacksburg for the first time since 1998. VIRGINIA 28, VIRGINIA TECH 21. Season to date: 7-4.
a little advice. Stop picking U.Va. to win this until it actually starts happening! !